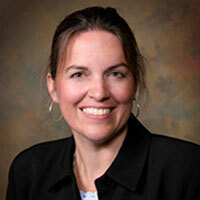 Geraghty-Rathert is professor of Legal Studies and director of the WILLOW Project. Anne Geraghty-Rathert was interviewed by St. Louis Public Radio, the Riverfront Times and the Associated Press about the case of Angel Stewart, a woman who has spent the past 25 years in prison despite suspicions that she was also a victim in the crime for which she was convicted. Geraghty-Rathert is professor of Legal Studies and director of the WILLOW Project, which represents women who are post-appeal, incarcerated and believed to have been wrongly convicted of crimes. Stewart has been paroled by Missouri, with help form the WILLOW Project, but still has a life sentence in Iowa. "They've been holding off, waiting for this moment," Geraghty-Rathert says of Stewart's legal team in Iowa. Now that Stewart's parole has been granted, there's no danger of her gaining clemency, only to be shipped to Missouri for another life sentence. Now, Iowa remains the only obstacle. Stewart knows that her fight isn't over yet. "She understands that there's still a fairly significant hurdle," Geraghty-Rathert says. "But not nearly the hurdle that Missouri was. That was the big one." “In Iowa, they have a very different process where they have a board that sort of hears it and then recommends clemency with the governor, which is what she would ultimately have to receive, because she isn't parole eligible in Iowa,"
The Public Radio story aired Wednesday night and Thursday evening, both in St. Louis and several other stations. See a history of the WILLOW Project in this Webster story.